Four-year-old Cape Cross colt Desert Fire maintained his progressive profile when leading home a Godolphin 1-2-3-4-5 in the closing mile turf handicap on week three of the Dubai World Cup Carnival at Meydan, UAE, on Thursday, 17 January. 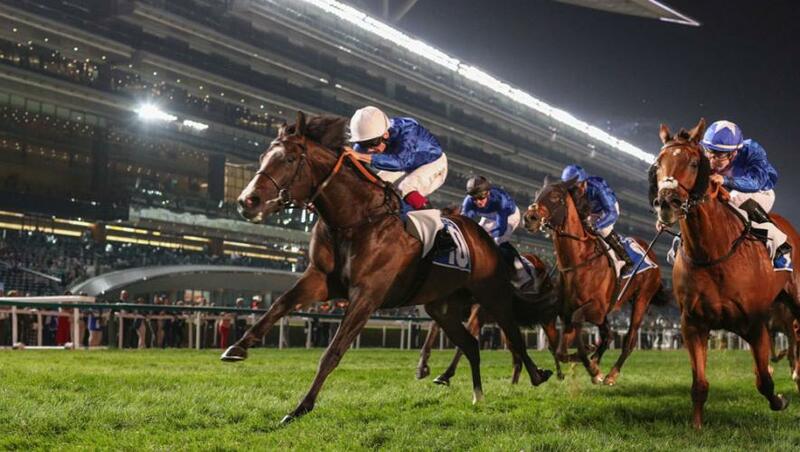 He was the fourth Godolphin victor on the night. Trainer Saeed bin Suroor saddled the first three home, with Desert Fire, ridden by Chris Hayes, gaining a third straight win following two victories over further in the UK last year and beating Race Day, with Kevin Stott up, and the unlucky Bedouin’s Story, partnered by Tadhg O’Shea. The winner was awkward leaving the stalls, but was pushed along and tacked across from a wide draw to settle a close third of the 11 runners behind the leader Poet’s Society and Race Day, a six-year-old son of Dubawi. Race Day went to the front at the top of the straight and ran on gamely but could not repel the challenge of Desert Fire, who got the measure of his stable companion inside the final 50 yards to prevail by a neck in 1m 36.84s on good going. Bedouin’s Story, a four-year-old son of Farhh, missed the break but ran on strongly in the closing stages to challenge inside the final furlong but had to be snatched up as a gap closed and finished a length behind. He only just held third by a short-head, with the Charlie Appleby-trained pair of Key Victory (James Doyle) and Fly At Dawn (Colm O’Donoghue) completing the Godolphin first five..
Saeed bin Suroor said: “Desert Fire is doing well. In England, he ran three times last year and won two races. “He showed his class over this trip tonight. The jockey kept him nice and handy, which helped him, and he finished the race well. “He is a horse we have always liked and we think a lot of him for the future. “Desert Fire and Race Day always work nicely in the mornings, just like Bedouin’s Story who was unlucky tonight. I think a mile and a quarter will be better for Bedouin’s Story. With Race Day, every time you run him, you get a better result. Chris Hayes added: “Desert Fire was very good and genuine. He is a big baby – obviously it is only his fourth start – and from the outside draw he jumped to his right. “Connections had told me to keep him awake, so I kept the revs up and got him into a nice position. But he was very responsive, switched off again, and I was able to fill him up. “He took a little blow and then when they were coming at him from either side, he was genuine and stuck his neck out. He is open to a lot of improvement. “Connections had filled me with plenty of confidence. The only worry I had was that when he jumped right out of the gate, he forfeited five or six lengths at least. I made it up quite quickly and my only concern was him taking a blow. Thankfully, I was able to fill him up turning in and he took a blow at the right time.